Institutes of people's education (інститути народної освіти, ІНО; instytuty narodnoi osvity, INO). Higher schools introduced in 1920 by Hryhorii Hrynko in place of universities as part of his general reform of the educational system of the Ukrainian SSR. They were formed out of the physical-mathematical-scientific and the historical-philological faculties of abolished universities and from teachers' institutes. INOs were divided into two faculties: the faculty of social education with a three-year program to prepare teachers for the upper grades of seven-year schools, and the faculty of professional education with a four-year program to prepare teachers for vocational schools. The faculties were subdivided into various departments. 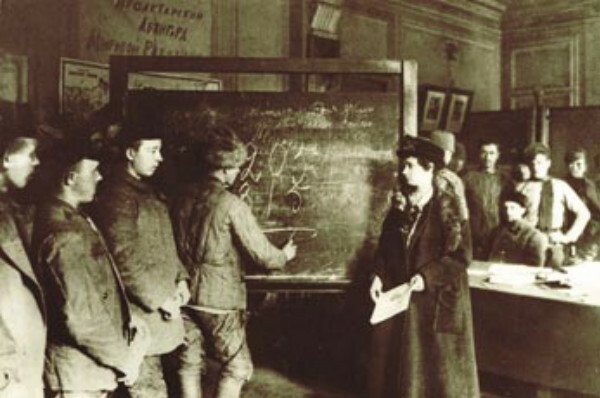 In 1929 there were 12 INOs: in Kyiv (see Kyiv Institute of People's Education), Kharkiv (see Kharkiv Institute of People's Education), Odesa, Dnipropetrovsk, Nizhyn, Poltava, Kamianets-Podilskyi, Zhytomyr, Mykolaiv, Kherson, Chernihiv, and Luhansk. Their total enrollment was 6,200, Ukrainians accounting for 65 percent. Most of the institutes published their own journals. In 1930 they were split up into more specialized institutions—institutes of social education, institutes of professional education, and institutes of political education.